الخيار الأفضل للحصول على المتعة والاسترخاء, كيو 1 رزورت آند سبا يقع في منطقة سارفرس باراديس في جولد كوست. يجذب هذا الفندق ذو 4.5 نجوم، والذي يبعد 1 km فقط عن وسط المدينة و 22 km عن المطار، الكثير من الزوار سنوياً. سوف يعشق النزلاء موقع هذا الفندق، فهو قريب من أهم المعالم السياحية في المدينة كمثل SkyPoint Observation Deck, Surfers Paradise, 7D Cinema Gold Coast . إن الخدمات الممتازة وحسن الضيافة العالي في كيو 1 رزورت آند سبا تجعل إقامتك تجربة لا تنسى. إن متجر, خدمة التنظيف يوميًا, مكتب الاستقبال على مدار الساعة, تسجيل وصول/خروج سريع, تخزين الأمتعة هي جزء فقط من الخدمات التي تميز كيو 1 رزورت آند سبا عن باقي الفنادق في المدينة. تعكس غرف الفندق البالغ عددها 305 المنتشرة في 75 طوابق جواً من الدفء والألفة.خدمات عصرية مثل تلفزيون بشاشة مسطحة, سجاد, مرآة, صوفا, إغلاق موجودة في بعض الغرف المختارة. يقدم الفندق العديد من الفرص للاستجمام كمثل متنزه ترفيهي, حوض استحمام ساخن, مركز للياقة البدنية, ساونا, مسار جولف - ضمن 3 كم. مهما كانت أسبابك لزيارة جولد كوست، فإن كيو 1 رزورت آند سبا هو الخيار الأفضل لإقامة مثيرة وممتعة. • يرجى ألا يكون مستوى الضوضاء مرتفعًا. عدم الامتثال لما سبق سيؤدي إلى إخراج النزلاء من العقار. تحتفظ Q1 Resort & Spa بالحق في الاحتفاظ بجميع رسوم الإقامة المدفوعة. يجب تقديم بطاقة هوية سارية عند تسجيل الدخول وسيتم أخذ نسخة منها. يجب أن تكون أعمار النزلاء 18 سنة أو أكثر، ما لم يكن هناك مرافقين كالوالدين أو وصيّ قانوني. أجر إضافي يتراوح بين1.3% و 3.36% سينطبق عند استخدام بطاقة إئتمانية. لمزيد من التفاصيل برجاء التواصل مع العقار. على النزلاء الذين يودون حجز الشقة ألا تقل أعمارهم 21 سنة خلال فترة المدارس السنوية إن لم يكن هناك مرافقين قانونيين أو الوالدين. سيقوم مكان الإقامة بحجز مبلغ مسبق على بطاقة السحب أو بطاقة الائتمان الخاصة بك والتي تطابق الاسم في الحجز بقيمة 10 دولارات أسترالية عند تسجيل الوصول، ثم فك الحجز خلال 5 أيام عمل بعد المغادرة. قد يتم تطبيق رسوم إضافية على الأضرار أو التنظيف الإضافي. Great location close to the beach, restaurants and attractions. The room was large with a king size bed that was two singles put together but they didn't match. There was a good size bath with spar and separate shower. The ocean views were limited due to surrounding buildings. Free car park and a nice pool. 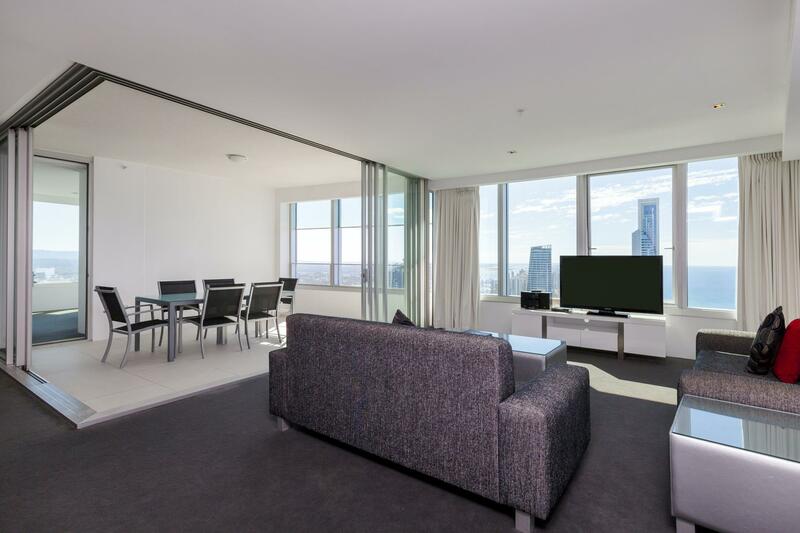 This is supposed to be the most famous building on the Gold Coast, so I chose this hotel without hesitation during my trip to the Gold Coast. The hotel has complete service facilities and free parking. I can choose to cook in our room or enjoy the food around me. The hotel staff were very warm and we had their help. I would be more satisfied if the hotel provided breakfast. The Q1 was pretty good value and had everything we needed including kitchenette, laundry and great living area to put a portacot. We were disappointed with the lack of service at the front desk, no porter and pool bar service. The pool lacked enough seating for the size of the property, and at times struggled to find shade. Would stay again, but be mindful that you need to be self sufficient. Full service properties typically come at a premium, and guess this is where they cut corners to keep cost down. We went for a 3 bedroom beach view high floor room and it was breathtaking and modern. So close to the beach and Cavill Ave but not as noisy as other places nearby. Tram station right outside the hotel and fantastic facilities. Kid friendly too! Pros: - big and spacious apartment - comfy bed - beautiful views, even in lower levels - buffet breakfast at SkyPoint is worthy for the views. - helpful staff Cons: - buffet breakfast at SkyPoint was good in terms of food options but does not offer a proper variety of hot drinks (no decaf or hot chocolate unless you pay extra, but also for normal coffee or tea the milk was cold no option for hot milk) - bath bombs for the spa were available at reception however no one informed us about it (not upon arrival, not a single note in the room compendium). This would be very handy for a relaxing bath. But also they weren't complimentary. Great view and good location. Room was amazing! with spa, kitchen and free parking (2 x cars). We traveled to this Resort last week, loved the facilities but the room cleanliness can be better. For some unknown reason, our room smells funny every time we go in to the room. Other than that, all others are great. Would love to go back again! 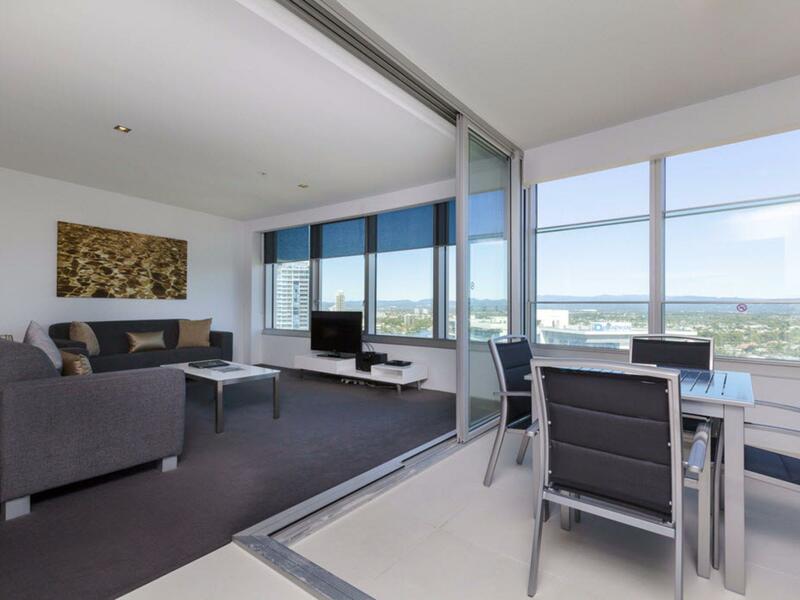 Close to the beach, shopping areas and the Esplanade. Check In and Check Out process was smooth. Room was clean and spacious. We got a room on the 54th floor and view was spectacular. Mostly city views but could also see the ocean. The spa in the main bathroom was a great way to relax. Daily housekeeping was provided. The pool, steam and sauna facilities of the resort were excellent. Lots of restaurants within 5 minutes walk from the resort including Indian and Thai restaurants, all of which had vegetarian food available. The staff was very helpful and were able to accommodate special requests we had. We had an excellent time at the resort and will definitely stay again. Highly recommended! Pros: Same as photos. Overall luxurious feel. Nice views if you can get a high floor (above level 40) as Peninsula is in front on the left and partially blocks the ocean view (depending on your room). Modern design. Large living area. Partitioned "balcony" with sliding glass doors . 90 degree view from master bedroom plus a TV. 3 clean swimming lagoons, 1 indoor pool. Large living rm area. Fast lifts. Frenly 24hr recept. 1 street away from the beach. Good overall security. *Overall wonderful luxurious experience. Will definitely come back to stay. * Cons: Toilet with Spa bath has windows with no shades (suggest installing rollers for privacy). Fridge LCD was damaged (Rm 4101). Could not see the settings. No tv in second room. Was able to hear some noise from unit above but bearable. Others: Compare bfast prices offered at Skypoint and Q1 before buying. Perhaps Q1 can offer more competitive bfast pricing as the Adult price is almost the same. This spa hotel provided a parking space for guest in their underground parking and had all the facilities I was after. The spa bath was amazing, i used it every night to rewind and relax. The beach was right outside the hotel, and to walk to central surfers where Cavill Ave is was roughly about 8mins give or take. Would definitely stay here again. I requested to check in early and Room 6802 was available. It had the best ocean view and kids loved it. The apartment was spacious and kids loved the entertainment room. Will definitely be staying here again. Highly recommended. great location (close to the beach, lots of restaurants and shops nearby) awesome view from the apartment great amenities in the apartment (kitchen utensils, washing machine & dryer) the apartment was clean suggestions: 1. put some blinds in the bathroom in between the twin and the queen room. there was no blinds whatsoever in that bathroom so when the sun is high in the sky, the bathroom could get pretty hot inside. 2. it would be better if we could turn on the AC for both the living room and the bedrooms without sacrificing the quality of the AC. Overall, awesome apartment.